Water damage can be a scary reality for East Coast dwellers, but with Kiwi’s 24/7 water damage repair team only a phone call away, we will put your mind at ease. If water damage does strike, it’s important to have trained professionals extract the water from your carpet and upholstered furniture as soon as possible in order to minimize damage. KIWI offers you the best in class trained professionals using commercial grade equipment to get your business back in order. 2. Thoroughly dry the contents of your business. 3. Disinfect all affected areas. 4. Rescue and store all personal items. 5. Monitor moisture levels in your business. Using high-end equipment and professional training to assist in removing all of the problems your business is facing from water damage, KIWI is the number one choice for fixing your business. 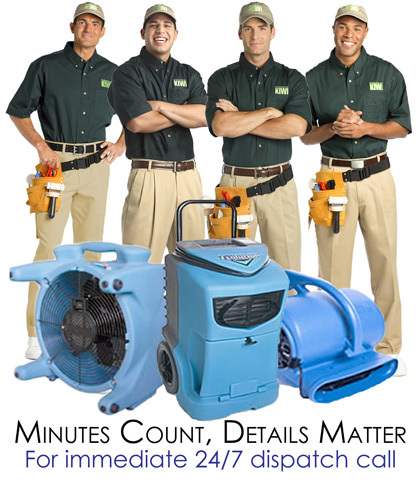 Our professional-grade equipment includes: high-speed blowers, industrial-strength dehumidifiers and heavy-duty pumps that can handle any water damage. If you have been subjected to any kind of water damage, KIWI is here to help. We will also work with your insurance! We’re bonded, licensed and insured. We’re also certified by the IICRC, which allows us to inspect and assess the safety of your business. We’ll test the moisture in your business, from the carpets and walls to the ceilings and even the air. Water damage is something you can’t afford to wait around to treat; the faster the response time, the better. KIWI is ready to help you get back to normal right away.